King Philippe of the Belgians and his lovely wife, Queen Mathilde, will be paying a visit to their Luxembourgish neighbours on December 2. The visit won't be a full-blown state visit but an official introductory visit for the new Belgian king who ascended to the throne upon the abdication of his father, King Albert II, earlier this year. While the schedule of the day isn't known (publicly) thus far, I expect it to be on a similar scale than the recent Dutch visit to Luxembourg and the even more recent Belgian visit to the Netherlands which means that there will be an official welcome in front of the palais by the Grand Duke and Grand Duchess, a more private luncheon in the palais also attended by the Hereditary Grand Duke and the Hereditary Grand Duchess, meet and greets with government officials and something taking place at the Belgian embassy. 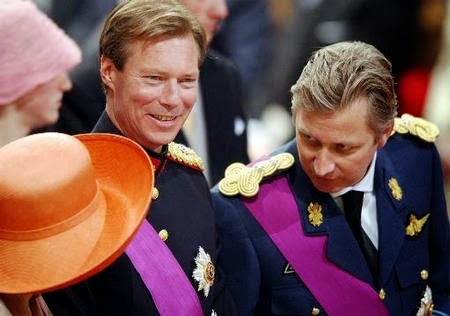 In case you aren't too knowledgable when it comes to royal relations... Apart from both being heads of state, Grand Duke Henri and King Philippe are also first cousins by being both grandsons of King Léopold III of Belgium (1901-83) and his wife née Princess Astrid of Sweden (1905-35). baby girl born on same day as Hereditary Grand Duke Guillaume?! Yes, I understand that she was due to be born later this month but was a little premature. Sorry, but little archduchess is fifth great-grandchild ( not third) and first great-granddaughter. Of course you're right. Must have mixed great-grandchildren of Grand Duke Jean and grandchildren of Princess Marie-Astrid up in my head. Thanks for the correction!